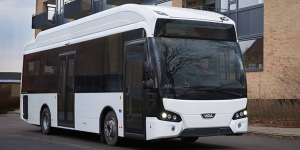 The Dutch company, VDL Bus & Coach, is expanding its Citea Electric bus series with the 11.5-metre long Light Low Entry Electric. The Citea LLE-115 Electric is available with various charging options, door configurations and flexible interior. For a little more than the last two years, the Citea LLE-99 Electric with a length of 9.9 metres has been operating successfully in various operations. VDL is now also offering an 11.5-metre length variant. The Citea LLE-115 Electric can be equipped with various flexible interior solutions, charging options and door configurations. The wheelbase of the Citea LLE-99 Electric has thus been extended by 1.55 metres. The Citea LLE-115 Electric has a maximum seating arrangement of 35 + 4 + 1. The new variant is equipped as standard with the 180 kWh battery pack, giving it a range of 100-150 kilometres on a single charge. In addition to the standard CCS plug, a pantograph enables quick charging at up to 270 kW. With this opportunity charging, the electric bus can cover up to 500 kilometres per day. In total, the VDL electric product range consists of three models, namely the Low Floor (also available as the Low Floor Articulated), Low Entry and Light Low Entry with lengths from 9.9 metres to 18.7 metres.